Beyond hotel restaurants (expensive!) and chain diners (boring! ), it's tough to score a decent breakfast steak in Chicago these days, but a few options await those in need of charred flesh in the morning. Ronny's has been grilling flesh for budget-conscious Loop diners since 1963. First thing you need to know: the address is deceiving. Although Ronny's resides in the northeast corner of the Thompson Center, you can't access it from inside. Instead, it has two dedicated entrances on the corner of Clark and Lake Streets. Second thing to keep in mind: Ronny's aptly named Breakfast Bonanza runs daily 7-11:30am (and until noon on weekends), so don't pencil it in for a late brunch. 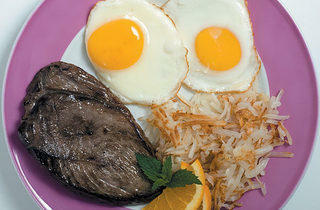 Hop into the cafeteria-style line bright and early for any of four steak breakfast platters. 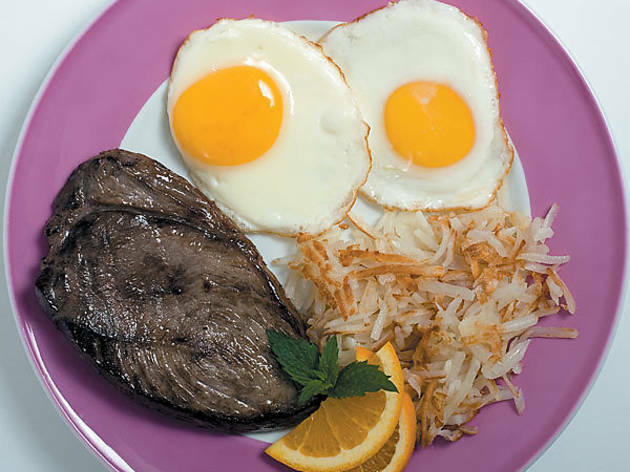 The bounty ranges from two eggs and a 6-ounce sirloin for $5.99 (upgrade to a 10-ouncer for an extra $6) to two eggs and a 16-ounce T-bone for $14.99. I settled on the Super Breakfast of two eggs, 6-ounce sirloin, french toast and hash browns for the gloriously low price of $7.99. Was the steak cooked to order? No. Was it a bit dry? Yep. But sop the eggs up with the steak and you're in business. This breakfast is so super that they give it to you on two full plates, one of which carries four slices of french toast topped with powdered sugar and strawberries. So you could conceivably enjoy your steak and eggs while a friend chowed down on the toasted raisin bread for a total price of four bucks a head. As for ambience, it's perfectly passable. The friendly grill man wears a toque to class the joint up, and you can take your cafeteria tray to one of the tall green banquettes that ring the dining room and dig in to the strains of Air Supply's greatest hits pumped out of the sound system with gusto. I ordered the "Our Steak & Eggs" for $10 at this chichi spot, but I should have taken a closer look at the menu description first: "Layered scrambled eggs-corn tortillas chips-black bean tomato salsa-steak & queso fresco with a garlic rice." It's tasty, but it ain't steak and eggs. Also, they skimp on the steak. The cupcake pancakes, however, are exactly what you'd expect them to be from the name: heavenly. Wishbone on Lincoln is one of my go-to spots for a spur-of-the-moment meal out. The vibe's laid back and the food never fails to satisfy. Knowing that Wishbone offers a Late Breakfast menu, I showed up to try the steak and eggs one afternoon to find out that it's only on the regular breakfast list, available 7-11am weekdays and 8am-2:30pm on weekends. My bad. For $11.95 during the week (and a buck more on weekends), you get a grilled 8-ounce New York strip steak, two eggs, your choice of home fries or black beans or grits (plain or cheese), and your choice of toast, corn muffin or biscuit. It sounds great, and I mean to try it soon. If you get there first, let us all know how it is. While the service is friendly and the steaks are cheap at the Broadway Grill, I can't recommend it. It's a classic Uptown spot down the block from the Green Mill with 12 stools on a red-and-white tile counter, three two-seat high tops, and posters of Broadway shows lining the walls. You can grab a window seat and watch the bums pass by. Which is what I did one recent morning after ordering the 6-ounce skirt steak with two eggs, toast, and hash browns with onion for $8.35. Unfortunately, I spotted a cluster of grease ants on the floor just before my order came up. I started in on the steak nonetheless. It was greasy, reasonably tender and had decent flavor. But after a couple of bites and another glance at those ants, I couldn't go on. The counter guy was very apologetic and said it was a problem sealing cracks that enable the ants to traipse in from outside. Fair warning.